Quite a teaser! The thought of waiting until the end of April to find out what happens may be torture, so here is a Q&A with Kelley Armstrong! I enjoy cross-country skiing, tobogganing, snowshoeing, and I’ve even gone winter camping in a homemade igloo, but my favorite winter activity would be curling up by the fire with hot cocoa and a good book. What inspired the Darkest Powers series? I’d had a book idea that was inspired by one of my adult novels. It was about supernaturals just coming into their powers, though, which in my world happens at puberty, so it wouldn’t work for an adult series. That idea was in the back of my mind as I began getting email from readers I considered a little too young to be reading my other books! After a couple of years of toying with the idea, I finally decided to try writing the book during National Novel Writing Month (NaNoWriMo). If you could have any paranormal power, what would it be? I would love to be a werewolf because I’d love to experience life in a different form. The secondary characteristics would be cool, too. Those “extras,” though, also make it hard for werewolves to blend, so if I was being very practical, I'd go with spell-casters. Their powers take work to learn, but overall they have fewer drawbacks. Werewolves or vampires? Who would win in a fight? Werewolves in my world have all the fighting skills, but it’s the vampires who get invulnerability. My werewolves can be killed any way that humans can, but my vampires need to be decapitated. . . and that’s not easy in a weapon-free fight. Nor would it be easy for a vampire to kill a werewolf with superhuman strength, agility, and senses. I’d say it would be close to a draw, and would probably come down to brains more than brute strength—which individual is smart enough to outwit the other. My process is constantly evolving. Being published means having a schedule, so it’s become very important to learn what methods work best for me. I’ve discovered I work better from an outline. So I have a rough, point-by-point plot outline. My finished novel never completely follows the outline, though. Better ideas come up as I’m writing, and I’m always ready to accommodate them. I’ve also learned that I’m happiest when I write the first draft straight through, without interruptions—taking a break to edit another book, for instance, really disturbs my flow and frustrates me. The first draft is a very intense process for me, and during that time, I’m rarely without my notebook. When the first draft is done, I ease back into a more relaxed editing mode. 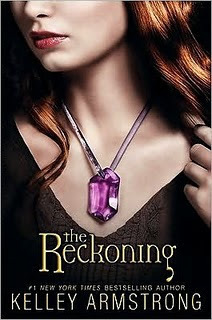 Be sure to go and vote at the 28 Days of Winter Escapes Giveaway website for a chance to win The Reckoning!